A diverse group of organizations and individuals are collaborating to conserve and restore playas in Curry County, New Mexico, with the goal of supporting the City of Clovis’ municipal water supply and providing needed habitat for migratory birds. The partnership includes city and county government agencies and organizations, soil and water conservation districts, local landowners, state and federal agencies, and nonprofit conservation organizations. On May 2, the partners came together to look at playas in various conditions and discuss playa restoration needs and opportunities. Most of the day was spent in the field, touring seven playas in close proximity to Clovis. At each stop, the group discussed recharge and wildlife benefits provided by playas, the condition of that particular playa and its watershed, and potential restoration activities for playas with similar modifications. Participants viewed satellite imagery of each playa, which allowed them to get a better understanding of potential impacts by comparing the aerial view to what was visible from the ground. 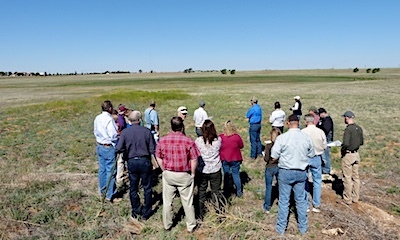 After the tour, there was a wide-ranging conversation about how to prioritize restoration activities to meet the various goals of the partnership, which include managing playas for recharge, wildlife habitat, and stormwater management or water retention benefits. While an action plan is being developed, PLJV will continue to work with the City and County to develop project ideas to apply for North American Wetlands Conservation Act (NAWCA) and other grants to support playa conservation. The City has already received a “Fund” recommendation for a small NAWCA proposal submitted last year and the partnership is looking forward to following that proposal up with additional ones.